When Amy from One Artsy Mama contacted me a few weeks ago about her awesome Holiday round of posts- I spent some time trying to think of traditions that I could craft out of. My family is very large- and we’ve got a lot of really great traditions- but how do I make a guest post about “Santa’s” bootprints on the livingroom carpet? Then it hit me. Hot cocoa. Its a BIG DEAL around here, warm caramel apple cider too. Once I found my inspiration, the rest was easy. Check out what I made! Wanna know how I did it? 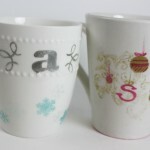 View the guest post up today at One Artsy Mama! Hello everyone! My name is Kayla and I’m visiting from Sweet Anne Handcrafted Designs. I work for a non-profit organization as a Web & Graphic designer by day, and in the evenings I relax and craft with my hubby. I’m very excited to share my latest Holiday inspiration with all of you, and special thanks to Amy for having me! Having spent all my winters in the blustery snow ravaged regions of Michigan, few things put me more in the Holiday spirit than Hot Cocoa. 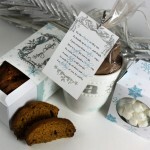 In my family, this warm treat is something to be savored, and its a Christmas eve tradition. My Husband and I even had a Hot Chocolate bar at our February wedding. It was a big hit. 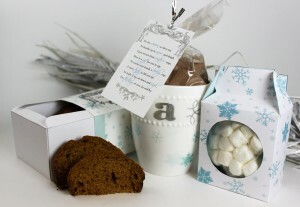 So this Christmas, I’m planning on making monogrammed mugs for each relative, with hot cocoa inside. This craft requires little investment, and is a truly heartwarming and personal gift for anyone in your life. 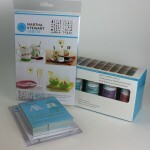 The new line of Martha Stewart all surface craft paint is top-rack dishwasher safe after 21 days or 30 min in a 350 degree oven. (NOTE: The paint cannot come in contact with any edibles. So that means painting only the outside of the cups). Let’s get to it! 1 sheet of card stock. Remove all stickers from the mug. 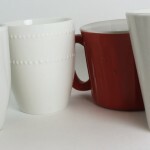 Then, prep the entire mug surface by wiping it down with rubbing alcohol or nail polish remover. 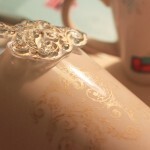 Using the self adhesive stencils, apply the craft paint as desired. 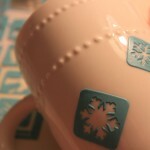 The self adhesive stencils are rubbery, and bend perfectly to fit the contour of the mug. I highly recommend them for this project. 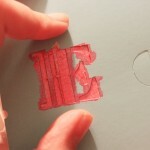 For the monograms, use a large letter stencil. Because the ones I had were stiff and did not sit well on the mugs, I held it in place and painted a light coat, then removed the stencil and used my first coat as a guide for subsequent coats. Experiment using stamps you might have on hand. Allow mugs to set 24 hours. 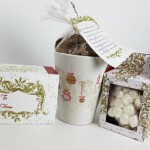 Print the Free Printable Hot Cocoa Poem onto a card stock of your choice. Cut it out and punch a hole in the top. 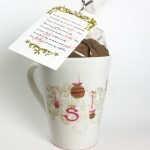 Place the cocoa bag in the mug, and use a ribbon or decorative twist-tie to secure the poem to the top. All done! You’ve made a WONDERFUL hand made gift. Thanks a bunch! I wen’t ahead and linked up! Great Site! !